A NOVEL ANTIBODY-DRUG conjugate is being investigated as a single-agent treatment for patients with advanced, platinum-resistant epithelial ovarian cancer that expresses a certain protein, in an effort to provide an effective option for a population facing a difficult prognosis. The drug is mirvetuximab soravtansine (IMGN853), and the phase 3 FORWARD 1 trial is testing it in patients whose cancers have medium to high expression levels of the protein folate receptor–alpha (FR-alpha). That’s because the drug targets FR-alpha, a cell-surface glycoprotein found on approximately 80 percent of epithelial ovarian cancer tumors; its overexpression may be associated with negative outcomes in patients treated with chemotherapy. The study also includes women with primary peritoneal and fallopian tube cancers that express the protein. If successful, the novel drug would offer an alternative to patients who have not responded to platinum-based chemotherapy, and possibly to individuals who have become resistant to chemotherapy. “This would be another agent available for patients with platinum-resistant disease, for which, outside of combination chemotherapy and Avastin (bevacizumab), there are really no therapies with an expected response rate,” said Kathleen N. Moore, M.D., associate director for clinical research and director of the TSET Phase I Drug Development Unit at the Stephenson Cancer Center in Oklahoma, and a co-principal investigator on the study. “If they can’t get bevacizumab — which a lot of patients can’t (due to issues such as risk factors for cardiac or gastrointestinal side effects) — then this may be their first line in platinum-resistant cancer. It gives another, better option with a higher chance of working over a longer period of time without as many adverse effects. It moves up the line in terms of options for patients with platinum-resistant ovarian cancer,” she added. It is estimated that 23,000 women are diagnosed annually with ovarian cancer in the U.S. Patients with ovarian cancer who are also resistant to platinum-containing chemotherapy comprise a population with an unmet need, as they are difficult to treat and they need more options after first- and second-line therapy. The global FORWARD I trial (NCT02631876) is currently enrolling patients at 79 locations, including many in the United States. It seeks to randomize 333 women in a 2:1 ratio to either the experimental mirvetuximab soravtansine arm or to chemotherapy consisting of investigator’s choice of paclitaxel, pegylated liposomal doxorubicin or topotecan. Eligible patients will have advanced epithelial ovarian cancer, primary peritoneal cancer or fallopian tube cancer with FR-alpha-positive tumor expression. Patients must also have platinumresistant disease, and must have received at least one, but no more than three, prior treatments. Patients with low-grade ovarian cancer or clear-cell ovarian cancer are not eligible, mainly because the investigators don’t think they will get any benefit from the therapy. 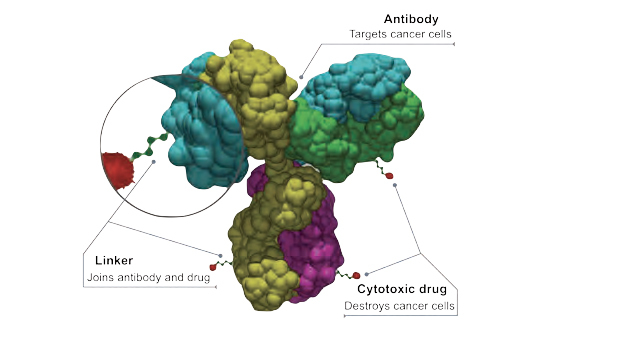 Mirvetuximab soravtansine acts like a “targeted bomb,” according to Moore, that is programmed to target FR-alpha and carries very potent molecules of chemotherapy that are very dissimilar to anything the patients will have previously received. The chemotherapy is going directly to the cancer cells, instead of to the whole body, as with typical systemic chemotherapy, which goes wherever there is a blood vessel. The cancer cell accepts the drug into the cell, like a Trojan horse, and when the medicine gets there, it releases its payload of chemotherapy and the cell dies. The chemotherapy molecules can then disperse to other cells locally and infect them, as well. Although the drug is generally well tolerated, one of its most common side effects is low-grade diarrhea in 30 to 40 percent of patients, according to Moore. Like other antibody– drug conjugates, the drug can also cause keratopathy, damage to the limbus of the cornea that causes transient blurry vision and is observed in about 10 percent of patients. Because preventing dry eyes often prevents keratopathy, lubricating eyedrops are mandatory in the study. Should keratopathy occur, persist or become more severe, the dose of the drug is either lowered or withheld entirely, and patients can resume the treatment after it’s resolved. Due to this risk, any patients who have a history of corneal abnormalities, which Moore noted is uncommon, will be excluded from the study. According to a pooled analysis of phase 1 expansion cohorts that was presented at the 2017 Annual Meeting of the American Society of Clinical Oncology, mirvetuximab soravtansine demonstrated a favorable toxicity profile and encouraging clinical activity. “The early-phase data is very strong in terms of the response rate and the duration of response, as well as the tolerability of the drug, so we are excited to move this drug into the marketplace, and we hope patients are excited about it,” Moore said. There were 113 patients with epithelial ovarian cancer in the pooled analysis, including a cohort of 36 patients who met the inclusion criteria for FORWARD I. In all pooled patients from the phase 1 analysis, the confirmed overall response rate (ORR) was 30 percent, and included three complete responses and 31 partial responses. The confirmed ORR was 47 percent in the group eligible for FORWARD I, including one complete response and 16 partial responses. There seems to be a lot of promise for the drug, and it is under investigation in other settings, as well. “There are several phase I studies running in combination with a number of chemotherapies, as well as with pembrolizumab (Keytruda) and bevacizumab,” Moore said. Mirvetuximab soravtansine is being developed by ImmunoGen.